Obtaining accurate strain measurements is a critical component of testing when it comes to validating aerospace structures designed for extreme environments. Using a 3D laser vibrometry system it is possible to measure the velocity at a point and from that calculate displacement. From that displacement strain can be calculated across an array of points. With a fine enough grid it is possible to obtain accurate full field dynamic strain measurements of an article under load. One advantage this method has over traditional strain measuring techniques is that there is no need to install additional instrumentation on the test article. This is critical to eliminate mass loading on lightly damped structures. Using 3D laser vibrometry, it is also possible to obtain dynamic strain measurements in extreme thermal environments. In order for this method to be verified it needs to be compared against more traditional, reliable strain measurement techniques. 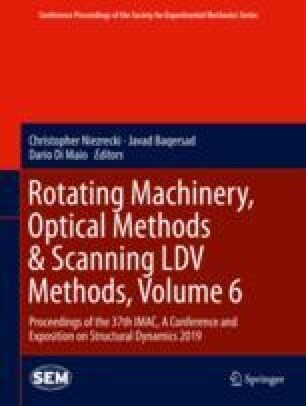 This paper will be comparing the results of the 3D laser vibrometry system’s strain measurements using several different surface treatments at several different temperatures to measurements obtained from traditional foil strain gages. I would like to acknowledge my colleagues from the Air Force Research Laboratory’s Structural Validation Branch (AFRL/RQVV) for providing technical assistance with the laser vibrometry system as well as reviewing and providing input for this report.